On June08/18 the plant in the attached picture was observed at the TBG and several gardens. Can you please identify it? Thank you for contacting the Toronto Master Gardeners with your plant identification question. 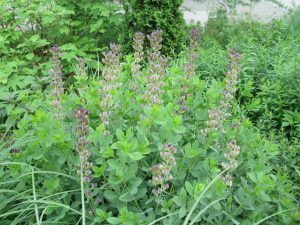 The details are hard to make out from the photo, but from the budding blossoms, it appears to be the False Indigo (Baptisia australius). It could be either the ‘Dutch Chocolate’ variety or possibly the ‘Blueberry sundae’. The plants are approaching near full height as you see them now, are about to bloom fro about 2 months. These are herbaceous, which means they die back to the ground each winter, then regenerate from the ground each year. They are a beautiful low maintenance addition to any garden, and can grow in either full sun or part shade, and can tolerate dry conditions. For more details please read more in the attached link.